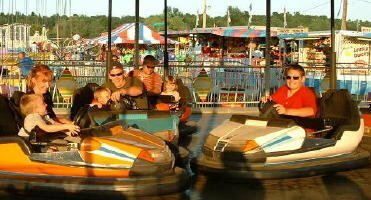 In the country, one great summertime amusement, especially for kids, was the carnival. Simple portable amusement rides, penny pitching, and bingo, hot dogs and other eats and drinks. My first such event was some organization's summer daytime picnic-and-funtime event that featured contests like three-legged and wheelbarrow races. My own fascination, as a pre-schooler, was a ride where little cars go round and round on a circular track. I stood there, watching intently. My dad asked Did I want to ride in one? I said I didn't think I could steer it. You don't have to steer, he assured me, it stays on the track itself. Oh yes, in line I got and into a car and around I went. At the end of the ride, into the line again, another ride, and into the line again. I was having a great time! Other things on that afternoon I just don't remember. Much older, I'm at a carnival — a fund-raiser where volunteer firemen are raising money for extras not in the budget. Pa wins a ham in a raffle, fair enough. I win some money, but not in a supremely honorable way. My scam is this: at penny pitching, there's a raised square in the center of the board where, if I get a penny to stay on it, I get a quarter back. Well, after a bit of practice, I develop this trick: I pitch the penny flat onto the board in front of the square and it often bounces up, still flat, and maybe once in fifteen tries it lands and stays on top. So, with the odds in my favor, I spend most of the evening there, and come home five dollars richer. Now, if the carnival had been put on by a normal money-making business, I'd have been proud of it. But for the firemen, who were spending time and energy, and putting themselves at risk, training for and fighting fires, was I not taking away from them a coffeepot for the firehouse, or something else that they deserved? Nothing to be so pleased with, I'm thinking. I could donate my five dollars back to them, hey, maybe even six dollars. But I never did. As I write this, I'm wondering if there is still an East Concord Volunteer Firemen's organization, and whether I should send them five dollars. Or maybe six. Oh, gosh, and the compounded interest for sixty years! 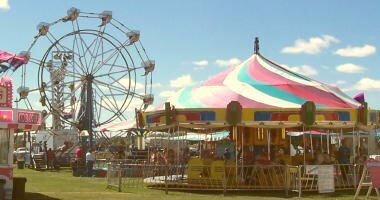 There was once a carnival in Springville that opened with a parade for a mile down Main street. Kids in costumes or all sorts, and Fred, Marie and I walking on stilts that we had made. We made them rather tall, and I had not practiced enough, especially for the long haul. What happened was for me both a disaster and a triumph: I lagged behind my siblings. And, in fact, behind the entire parade. The organizers had not anticipated this peculiar possibility, and had provided no rear-guard sentinel. I doggedly continued and found myself, for 20 minutes after the parade had gone by, still awkwardly hobbling down the center of Main Street, despite normal evening auto traffic. I felt grossly embarrassed, out of place and even in danger. But quitting would have been more shameful. I did finish the course, but I think the experience shut down my aspirations as a circus performer. Speaking of circuses: in the summer of 1952, a couple guys and I spent summer vacation from college working at the O-I Glass Company in Toledo. An old-time circus train rolled into town, a caravan of dozens of trucks, each of which carried animals, or unfolded into a huge section of bleachers, etc. We watched in admiration one night as the whole thing got set up for two days of spectacular circus and, during the following night, folded itself up and crawled away. The logistics were stunning, even to us young engineers. There may still be itinerant groups as extravagant as the one we saw, but I'm guessing that it's becoming a thing of the past. The size of the establishment was not, in itself, impressive, but rather the fact that such a huge-tent three-ring circus can crawl across the country that way. There were also circus side shows that I hope no longer exist. 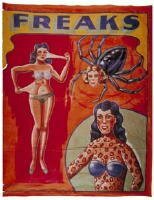 "Freaks," for example, the woman with a tiny, pointed head, sitting on a tall stool for everyone to see. As a spectacle, it was gross; I was not amused. The setup, however, had the symmetry of a zoo where primate visitors and residents amuse each other. There she sat grinning from on high, jerkily waving and gawking at the gawkers. Was she a victim? Happily and gainfully employed? She did seem to be really enjoying herself. Nevertheless, the display was absolutely obscene; I will surely not be faulted for also saying that I can't say exactly why it was obscene.